The Mendham boys distance medley relay team had one thing in mind when it took the line to run at Saturday's Dodgertown Relays in Madison. How about a NJ#1 US#10 10:19.08 to win the race by 26 seconds over Mountain Lakes. That's more than 15 seconds faster then Mendham ran last week when they went 10:34.21 to win the DMR at the Summit Relays. Princeton-bound Jack Stanley got things rolling for Mendham on Saturday with a 3:05 and change 1,200m carry. Senior Tucker Ward followed with a 52 point quarter leg. Junior Sam Marran then split 2:02 and change for 800, and junior Jack Jennings finished it off with a 4:19 point anchor leg. Mendham's 10:19.08 is just of its school record of 10:17.83 it ran to place sixth at the Penn Relays last year. 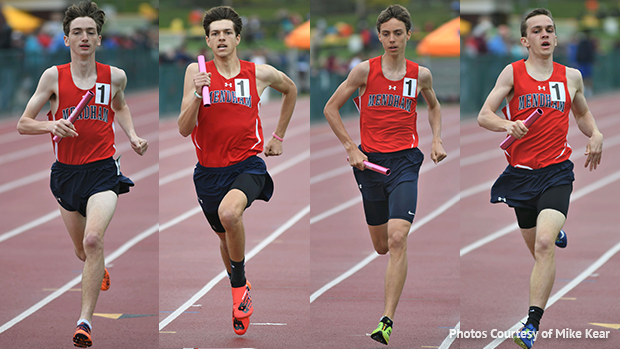 Mendham also won the 4x800 in 8:06.06 as Jennings, Stanley, Marran, and Ryan Kear shared the baton. That's just off its NJ#5 8:05.66 that Mendham ran at the Summit Relays.